The Foothill Ranch bee removal services provided by The Bee Man are quick and effective. The processes we use minimize damage caused accessing the infestation area and prevent future infestations from returning. It is important to not attempt to remove a bee infestation yourself. The largest amount of bee infestations in Orange County are from feral honeybees. These wild bees will spawn off an original colony when a new queen is born. The old queen will take have the colony with her and swarm away looking for a new place to build a hive. These swarms may last up to 3 days while scout bees are looking for a new hive location. 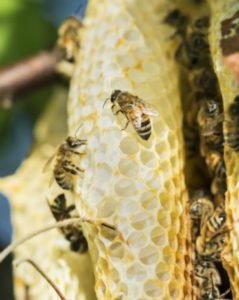 Once a location is found, the honeybees will start building their hive. That’s when the problems begin. There are two main varieties of feral honeybees. The European honeybees are far less aggressive than the Africanized “killer bee.” European honeybees have smaller colonies and will only send out hundreds of bees to chase off any intruder that approaches their hive. In contrast, the Africanized honeybee will defend their hive with a vengeance. For that reason, they will send out thousands of bees to attack and eliminate the threat. These “killer bees” are known for causing serious injury to humans and sometimes killing small animals. Please visit our “Bee Safety Tips” page to learn what you should do with any bee infestation you may encounter. Whatever type of bee infestation you may have, The Bee Man can remove the hive and restore the safety in your area. We advise not disturbing the bees. Please call us to have your bee infestation removed by experts. Finally, if you need any Foothill Ranch bee infestation removal, please contact The Bee Man at (949) 455-0123 before any property damage occurs.